Top-rated Projects. Step-by-step tutorials. Subscribe now! Top-rated Projects. Step-by-step tutorials. Taking into account our favorite parts of spring, we challenged our designers to create stunning pieces that embodied the season. From the lightweight and colorful scarves featured in the Spring Forward section, to the trendy Cacti-inspired projects included in our Cactus Makes Perfect round up, you’ll find bright pieces for both your home and your wardrobe. If you like knitting, you’ll love our projects! All 190 of them and all from the most creative minds in knitting! 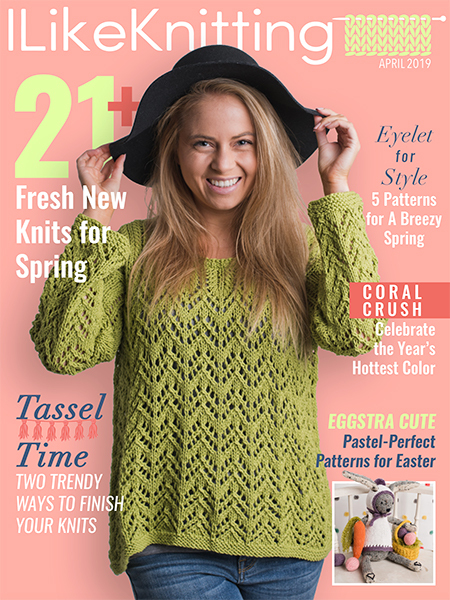 Get six issues of I Like Knitting, which includes up to 30+ projects, knitting tutorials, videos and more! I Like Knitting delivers a completely interactive digital issue on either a tablet or a computer. Enjoy our top-rated projects, gorgeous photography, videos and more by subscribing to the app edition in the Apple App or Google Play store. Use our website to subscribe to the computer edition for all that PLUS a searchable library—or get both editions for the best value! Get hundreds of free knitting patterns, how-to videos and tutorials along with great knitting tips when you sign up for the AllFreeKnitting.com email newsletter, Knit Picky Patterns, and special offers. If you are not a subscriber, click here to see subscription offers. Subscribers will have unlimited access to inspirational crochet patterns, crochet tips and tutorials, interviews and more! If you like knitting you'll love I Like Knitting! Instant access to our pattern library! That's up to 600+ premium patterns for FREE! Copyright 2019 © Prime Publishing LLC. All rights reserved.